The US Cross season finally is always capped off with the Nationals . These days in Jan , so it extends the season for everybody a little . This year Biltmore Estate , Asheville was the host and little closer driving distance for us on the east coast than in the previous years . Most serious cross racers race 20+ races leading up to this final race and this is the day you want to be at your best of course which is easier said than done . It all depends on how your whole year has been , how much racing and training you did in the past winter, spring and summer. How was your fitness and how much fatigue you had going into the Cross Season. How much racing and how much driving to races you did during the season . Key questions are ; are you healthy , motivated and at your peak ? As you can see there are so many outside factors controlling how you will feel and do on race day . Going to a Nationals are logistically also different than just a local weekend race . Asheville is about 11-12 hours from our area driving . Sitting in the car for that long is not good for the legs and you can not go the day before your race . There has also been a few weeks since you raced last due to the Holidays , so getting some race intensity in is critical and can be challenging if no races are available . A few of us did a ” training race” in Kingsport, TN the Sunday before which was a great way of shaking out the legs a bit and get a few more rides in before the actual Championship race . It also gave us a few days to get settled and set up in Asheville. The venues are big at these events and getting to know everything including pre- riding the course is critical. Time here is your friend and all these points are just getting you to the start line . Now you still have to have your race of your life to do well when the gun goes off. The course was a real Cyclo-Cross course with all the elements the sport of cross is and should be – a true Championship Course . Safe slight uphill start . Hills to make the selection and technical down hill parts as well . Challenging off cambers , wide course with multiple lines to choose from all around and a great spectator course . 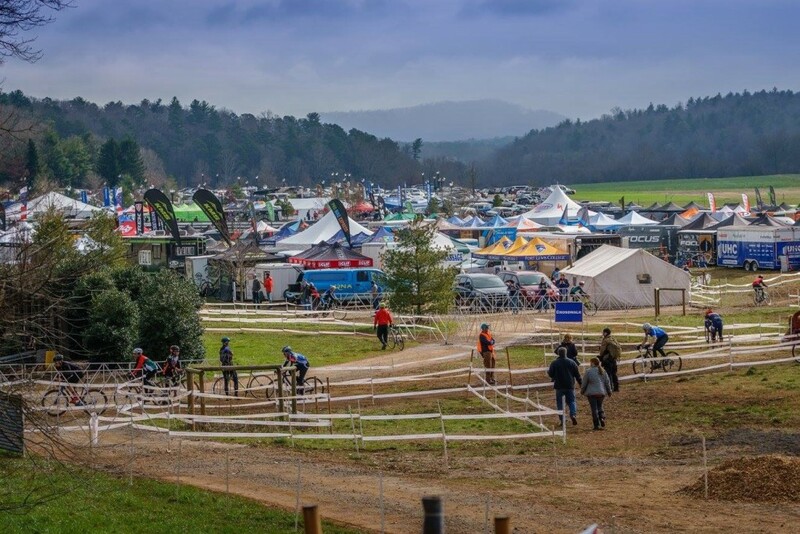 Easy to get to the start and pit area and the strongest , fittest and most skilled rider will win on this course in every category, exactly how it should be . Tire choice and tire pressure is always key in a cross race , no different here. The conditions were changing everyday as was the lines and the course due to freezing , thawing and a little rain. FinKraft coaches a lot of athletes racing cross and we had 6 competing at this years Nationals. Also a lot of close cross friends and Finkraft was part of Bayhill Capital & Corner Cycle tent Village . Great set up and perfect location in the Team Tent area with so many great racers and people getting prepared for their races. One of my favorite parts in Cross racing is the Community and atmosphere that is created by everybody coming together for any race. Karen Trip ( FinKraft Cycling Team – Women) took the top step , 1st W 55-59 . She knew the course really well and rode a great race , in 100% control and a clean race with no mistakes. great preparation and experience , that is how you win big races when all the pieces of the puzzle comes together when it really matters. Tyler Munroe 5th in the M 55-59 , Tyler is a very talented racer and very experienced , riding his own race and being right on his limit also gave him a spot on the podium. Nate More 15th in the U23 , Nate had an unbelievable start and was in 3rd at one point on the first lap . Great comeback after surgery this fall . More to come from Nate in 2016 . Ryan Aittaniemi , 30th in 17-18 Juniors, a super competitive field , but he held his own and fought hard. Ryan races with that fire and competitiveness you want to see in a racer . Great quality to have. Both Nate and Ryan had pretty muddy conditions , so bike changes which all went very smooth , another element in cross. Geoff McIntosh , 38th in the 50-54. Great start and great experience for Geoff – great guy to coach and be around and very helpful with everybody around . A perfect example of a great team guy , I know Geoff wanted a better results , but he did not have a bad race by all means , his field is very competitive and very close. Todd Peterson , Non Championships and Single Speed on Friday 108th , Tood was not in his best condition going into this race due to injury he has been battling all fall. The experience at these Nationals were priceless though and well worth the trip. Just by doing these type of races you come out a better racer and you can pass on the knowledge to others no matter what the results in the races are . Lizzy and Greg Gunsalus both had phenomenal races, Lizzy 2nd ( 13-14) , Greg 13th ( 15-16) , as did Ryley Mosher taking 5th ( 13-14) . Awesome Racing by all New England , Mid Atlantic and NJ Cross Friends.